A recruitment professional with over twenty years’ experience in the field and a record of entrepreneurial accomplishment, David Mackenzie is Managing Director and Head of HR at Mackenzie Jones. In 2003, he set up the recruitment agency in the UK, growing the business across two offices in London and Birmingham. In 2005 he established the company in Dubai to serve the Gulf region and neighbouring countries. 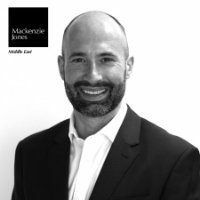 As the Group MD, David is responsible for the overall direction of the Mackenzie Jones Group including Mackenzie Jones, MumsAtWork, MENA Solutions, Simply Digital and ThinkTech.